KAJUN GUMBO: Sugar-Free Lemon Pie recipe, so refreshing! Sugar-Free Lemon Pie recipe, so refreshing! We live on the beautiful Gulf Coast in a beautiful city with access to pools, tennis, golf & the friendliest neighbors ever! We are a stones throw away from fishing, casinos, waterparks and love all of it! We have 2 daughters, 1 son, 3 beautiful grand-daughters and 3 soon-to-be stepsons. God has truly blessed us in the family department. I have all this and yet the only thing I ever blog about is my weight. I agree that my Friday weigh-ins are important to keep me committed to my healthy lifestyle. Today it dawned on me that perhaps I need to give equal attention to other parts of my life....so, beginning today this blog will be about so much more than dieting. I will totally understand if my fellow WLS bloggers want to skip over these posts. This blog is about me and what makes me happy and gives my life meaning. ﻿﻿﻿Father's Day was yesterday and we all treated Hubby like the king he is. He is truly a wonderful man and Father. We started the day swimming laps for 30 minutes. 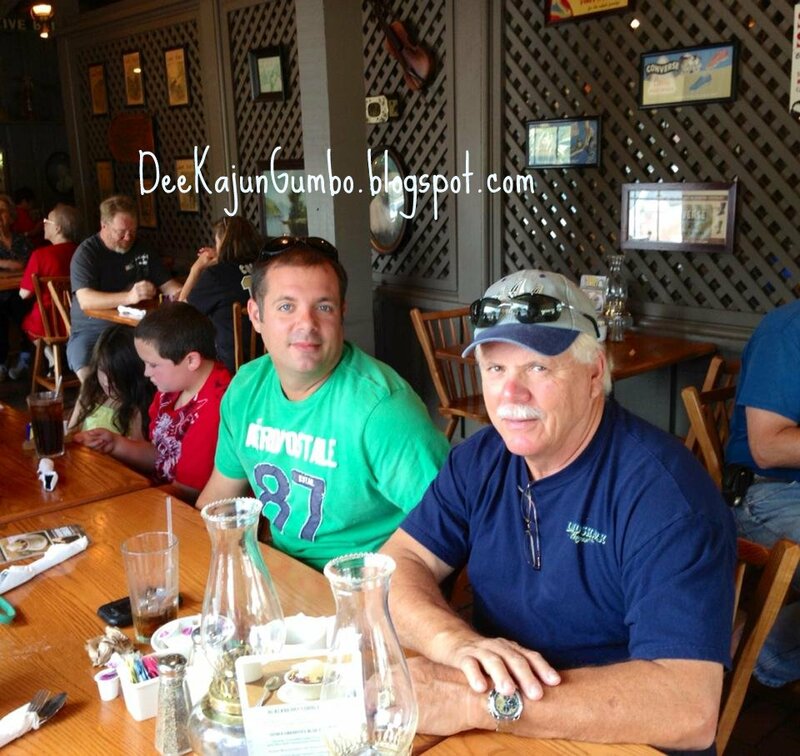 Afterwards, we met our Son, DIL & grandsons-to-be at Cracker Barrel and had a great time. Our daughters were off doing Fathers day with their DH's and kids. The rest of the day, I tried really hard to let Hubby do his own thing. He spent the day doing his two favorite things watching baseball and horseracing. I fertilized our garden with some miracle grow. We have not had much luck with our garden this year, I think we may have planted too late. I am trying everything I can to get the plants to show some growth. Combine the lemonade mix and pudding in a medium sized bowl with a whisk. Slowly add the milk & juice from lemon while whisking. Fold in thawed Cool Whip and mix until its fluffy. Pour into pie shell and refrigerate about an hour. OMG is so good ! We're always looking for healthier treats. Hubby loves it, last time I squeezed a little fresh lemon juice into it to make it more lemony.